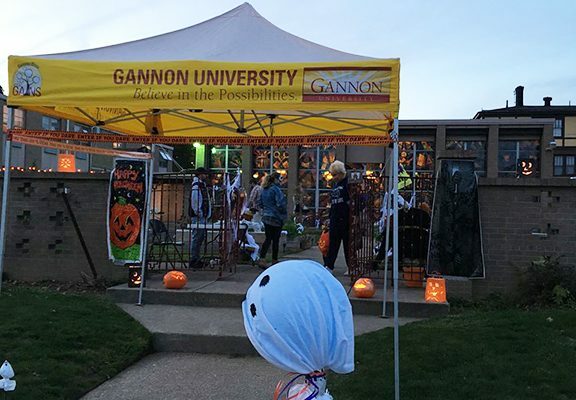 Halloween in the Garden was held in Gannon University’s Goodwill Garden during trick-or-treat hours Monday evening to educate the youth in the local Erie community. The garden was decorated for Halloween and allowed trick-or-treaters to enter and learn about various foods from volunteers. This free event was open to the entire Erie community, as well as students. The event included activities for children who were out trick-or-treating with their families, such as a coloring table, a piñata, snacks and a treat bag full of vegetables. This event was put together by students and faculty members of the Spanish Civilization class. Children were greeted at the garden’s entrance by volunteers. These volunteers were foreign language students who are taking Spanish Civilization this semester. According to Kathleen Cahill, assistant director of Service Learning, this event was created in order to introduce the Foreign Language Department to service-learning. 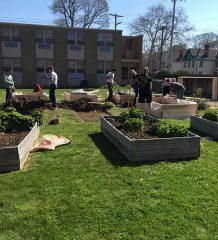 This was the first event that the Spanish classes had taken on as a service-learning project. Martha Kosir, Ph.D., an associate professor of Spanish, said that there were many educational benefits to the event. She said that this event was created to educate the public and students about where the food they eat and enjoy comes from. It also shed light on the history and cultural background of these foods. Krissy Gibson, a sophomore international studies major, said that she got involved in the event for a few reasons. She said that she had to attend the event for her Spanish class and because she loves kids, but also decided to get involved because the information that was being shared was important and interesting. Hayley Woebse, a sophomore undecided major, said that this event was both interesting and eye-opening. Cahill said that there were also other reasons that this event was created in addition to the educational benefits. “This event is aimed to give children and youth in the Erie a safe and engaging trick-or-treating experience,” she said. Tables were set up throughout the event to give additional information on the various foods that have come to America from different countries. The foods included potatoes, corn, tomatoes and chocolate. Children and parents got the chance to walk through the garden and stop at each table to learn more. The tables included posters that gave pictures and information on each type of food that was highlighted for this event.